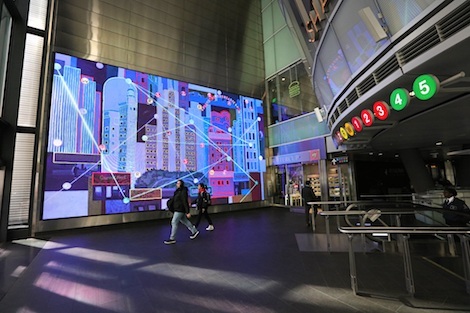 As commuters meander between the subways and shops of Manhattan’s Fulton Center, passersby are likely to be stopped in their tracks by the vivacious energy of a newly commissioned site-specific digital artwork, Fulton Flow. Fulton Flow is a stop-motion animation by Brooklyn-based artist Ezra Wube, who took meandering walks around Fulton Center and lower Manhattan, tracing the original path of the IRT Lexington line extension from the Brooklyn Bridge–City Hall station to the Wall Street station. These walks formed the inspiration for Fulton Flow, generating memories and impressions that incorporate movement, architecture, street signs, colors, and shapes into a visual rhythm that resonates with the placement and dynamic compositional settings of Fulton Center’s digital display monitors. 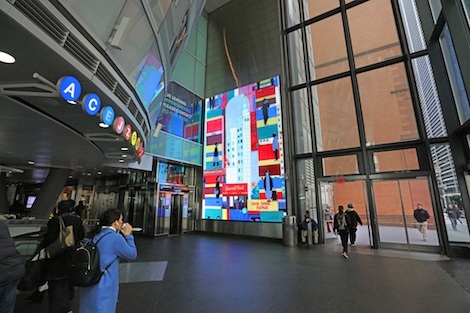 Sandra Bloodworth, director of MTA Arts & Design told us “Ezra’s newly commissioned digital artwork is truly place-specific – vividly celebrating and honoring the past, present, and future of Lower Manahattan and Fulton Center. Through the use of dynamic digital signage, our Digital Art program allows us to engage with our riders in an immediate way, transporting them to another place, space or time as they go about their daily commute”. The making of Fulton Flow is a heavily process-orientated creation built upon layers of a single painting by Wube. Referencing his visual impressions of lower Manhattan and Fulton Center, Ezra painted a single, wall-sized canvas, from which the myriad digital animations that comprise Fulton Flow were then adapted. After painting a scene, Wube takes photographs of the painting and then continues to paint the next frame as a new layer of that same painting. As the process culminates, Wube then combines the sequential photographs into an animated work. Fulton Flow considers both the original development of lower Manhattan’s subway service alongside present-day Fulton Center, highlighting the neighborhood’s unique locations while connecting its historical past to contemporary everyday life. Ezra Wube said “As an everyday commuter, I was excited to be working on trains as a subject and learning the history of the neighborhood. I also feel that there is a strong poetic connection between trains and animation or motion pictures”. Yaling Chen, Deputy Director and leader of the Digital Art team at MTA Arts & Design (who kindly led a tour of their work during New York Digital Signage Week last year) told us “The network at Fulton Center offers a unique canvas for new media artists, and the back-end synchronization allows the content to be displayed as envisioned,” said Ezra worked with our team and partners from Westfield Properties and ANC Sports and the outcome exceeded his and our expectations”. It is worth mentioning the role of Paul Fleuranges in all of this. Paul started the digital arts programmme and when they rolled out their first piece ‘New York Minute by Gabriel Barcia-Colombo‘ after Fulton Center opened in 2014, he insisted that the Arts & Design staffers working on the digital art program visit shows such as DSE learn about digital signage. They all took the installation tours, walked the floor and talked to vendors about displays, content, CMS systems, and immersed themselves in the educational seminars. No doubt, their attending the expo, sitting in on those seminars, taking those tours has helped them in dealing with all of the MTA partners, such as Westfield and ANC Sports. Under Paul’s supervision and guidance, it is clear that the MTA staff learnt how to structure the call for artists, how to evaluate the art and interact with and assist the artists once their art is chosen for inclusion in the program. It is fair to say that because of his early work in this field, the MTA Arts & Design staffers have been allowed to, and become true subject matter experts. Ezra Wube (b. 1980, Ethiopia) is a mixed media artist lives and work in Brooklyn, NY. His work references personal and social ideas of belonging, the notion of past and present, the constant changing of place, and the dialogical tensions between “here” and “there”. His exhibitions include The 13th Biennial de Lyon, Lyon, France (2015); Dak’Art 2014 Biennale, Dakar, Senegal (2014); The 18th International Festival of Contemporary Art SESC Videobrasil, São Paulo, Brazil (2013); and Time Square Arts Midnight Moment (2013). His residencies and awards include Open Sessions Program, The Drawing Center, (2016); Wave Hill (2016); Rema Hort Mann Foundation, Emerging Artist Grant (2015); and the Triangle Arts Association Residency (2015). For more information about his work click here. This entry was posted on Tuesday, April 9th, 2019 at 15:21 @681 and is filed under DailyDOOH Update. You can follow any responses to this entry through the RSS 2.0 feed. You can leave a response, or trackback from your own site.